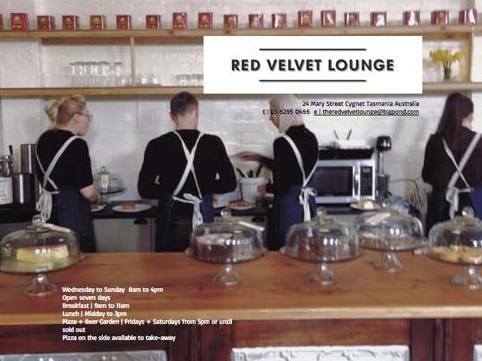 Red Velvet Lounge is nestled along the main road of peaceful Cygnet- the perfect lunch getaway from central Hobart (45 minutes drive or so). Open seven days with breakfast served until noon, there's no rushing in this cruisy country town. The dinner menus reflect the Huon and Channel area's incredible bounty of produce and it's a chance for Red Velvet (as they say) to 'frock-up' and pretend they're a real grown-up restaurant. They'll make your evening a special one with a unique taste of southern Tasmania. The daytime menu changes with the seasons and is often supplement by a changing blackboard specials menu that highlights local produce that is available that morning.